In need of some mental recharge? Then it is time to pack up your bags and set off for a quick getaway to waterfront villas. As there is nothing like jaw-dropping views, scrumptious food and tranquil settings, to cure the blues. Don’t know where to find one? 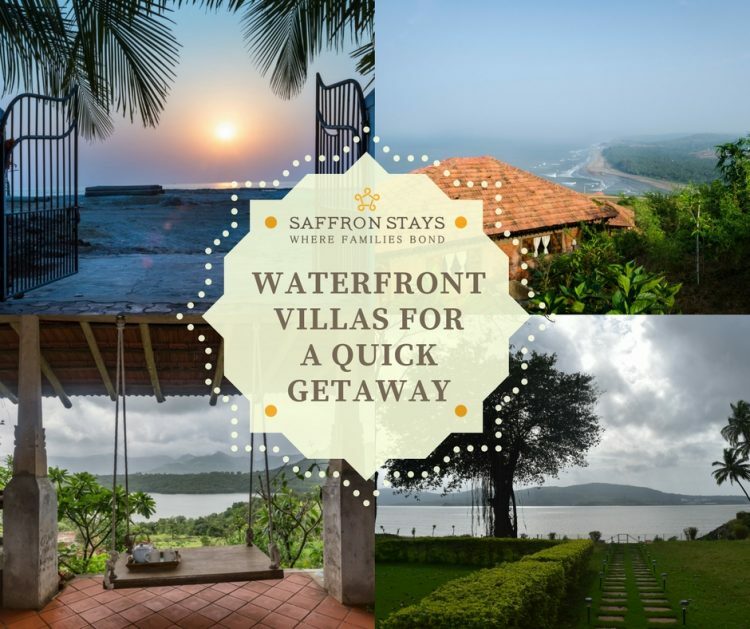 SaffronStays is here to solve your dilemma and brings you the wonderful waterfront villas for your quick getaway! Luxuriate in the privacy, savour the serenity, gorge on delicious meals and get inspired by the magnificent views. Here’s a list of six waterfront villas for your quick getaway to unwind! Perched on a cliff, SaffronStays Villa 270°, offers stunning views of the Arabian sea from all sides. It has five stunning cottages which can be booked individually. This villa has a rustic setting, designed using the stone age style. This quaint homestay with a lovely garden and a man made pond, offers the perfect chance to relax. So, enjoy gorging on delicious Konkani seafood delicacies while the panoramic views keep you company. SaffronStays Salt Rim, a 2-bedroom beachfront villa, can accommodate up to 10 guests. With Goan and Portuguese style decor, the wooden decor and earthy tones soothes the tumultuous soul. This is perfect for the ones in need to recharge as there is no inhabitation for half a kilometer. Feel the wind in your hair, the sun on your face and the sand beneath your feet as you make an escape to this heavenly abode. SaffronStays L’attitude, a lakefront villa, is an incredible 3-bedroom villa which can accommodate up to 9 guests. Built with reclaimed wood, mud and exposed brick it adds a raw charm to the interiors and is a soothing retreat for everyone. Sit on the deck and experience the splendid sunsets and sunrises. The perfectly meshed rustic setting and luxurious interiors offers luxury and comforts to its guests. SaffronStays Little Paradise, with its own private and secluded beach is perfect for a romantic getaway. It has 3 wooden cabins which can be booked individually and can accommodate up to 9 guests in all. Sink your toes into the water, lounge on the secluded beach or enjoy the amazing ocean breeze from the comfort of a cozy front porch. This is a perfect getaway for the one’s seeking solitude. Away from the cacophonous crowd, savour the much needed tranquility at SaffronStays River Rock. A 2-bedroom villa, it is pet friendly where you and your furry little friend can frolic all you want. Lounge in the private outdoor jacuzzi or dip your toes in the bubbling river nearby! This brick-and-mortar edifice can accommodate up to 6 guests and is perfect for a rustic rejuvenation. An earthy home, SaffronStays Fragrant Sun, offers its guests an expansive view of the Mulshi lake. A 4-bedroom home, the rooms can be booked individually and it can accommodate up to 16 guests. It is surrounded by lawns with a bonfire sit-out, gardens, fruit trees, herbs and vegetable patches. Savour the mouth-watering food while the mesmerising views make it hard for you to ever leave! To book your next stay with SaffronStays, send a mail to [email protected] with the name of the home in the subject line!